The frustration seemed to melt off David Ortiz after one sweet swing. One swing that elevated him from the role of struggling big man to dominant designated hitter. That's not to say, of course, that Ortiz's ordeal is over. One hit, even a grand slam, does not necessarily cure several weeks' worth of strikeouts, not-quite-checked swings, and ground outs to the right side. Ortiz had been feeling better this week, since Red Sox manager Terry Francona gave him a mental health day Sunday. His knee had been good. His outlook, too. And, certainly, his swing. "This week, these past few days, since I came back after I had the day off, I've been getting that feeling," Ortiz told WRKO Radio after last night's 11-3 win over the Rangers. That feeling. Good for the Red Sox. Not so good for the opposition. And for Daisuke Matsuzaka, who needed a bit of a bailout, it was the perfect time to connect, with the Sox trailing by a run and the bases loaded. And the perfect swing, which lifted with it the 37,902 fans packed into Fenway Park. After the ball came down in the front row of the Monster seats in the third inning, after his teammates gave him a brief version of the silent treatment before exploding in congratulations, Ortiz seemed ready for it to happen again. He followed his opposite-field shot with a liner to left in the sixth and a ringing single to right-center to score Sean Casey in the eighth. "As long as I've been here, we've been trying to build a good relationship between all of us," said Ortiz, who was not in the clubhouse after the game. "When somebody struggles, you've just got to let him know that there's always a next day, and give him the confidence to come through next time." That he did. With two outs in the third, Jed Lowrie doubled, his first extra-base hit (and second hit of his big league career). That was followed by Jacoby Ellsbury and Dustin Pedroia walks against Luis Mendoza. Then came Ortiz. "As much as he means to us . . . everybody's there for him," Francona said. "He's important to us. They're really pulling for him." It was Ortiz's second home run of the season, the other coming April 2 at Oakland, and also just his second extra-base hit. That is not normal for him, nor is the .111 average with which he entered the game, nor the four RBIs, an output he doubled on one swing. It has all quite obviously been weighing on him, which prompted the day off. Since then, Ortiz started using his knees more. After all, they can handle it after offseason surgery. After having just three hits in 12 games before his day off, Ortiz has six in the five games since. "I thought tonight he swung the bat very well," Francona said. "It's been a rough road for him. Sometimes you're not going to get it all back - if it takes you 10 games to get there, sometimes it takes you [a while to get back]. He's going to look up there [at his batting average] for a little while and not see what he wants. But if he swings the bat like he can, he'll look up there after a time and he'll be where he's supposed to be." 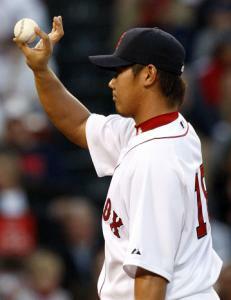 Matsuzaka, meanwhile, isn't where he's supposed to be. Though he had two straight good starts after his poor outing in Tokyo, his last two (including last night) haven't been nearly as positive. He has given up seven earned runs over 10 1/3 innings in his last two outings, failing to pitch deep into games and not consistently throwing strikes early in counts. He allowed a run in the third inning, then a two-run homer to Hank Blalock in the sixth that knocked him out of the game. "For the past two games, even though the team has won, I feel bad that I've been a drag on the team," said Matsuzaka, who improved to 4-0. Ortiz's grand slam was followed by a five-run fourth inning that put the game out of reach for the Rangers. Four players had RBIs in the inning, which was capped by Pedroia's two-run home run that also scored Ellsbury (triple). Ortiz added his RBI single in the eighth, and Ellsbury scored for the third time on an error by first baseman Jason Botts. "I never kill my confidence," Ortiz said. "I stay focused on coming the next day and work out and going back out there. Everybody talks about the way you start the season, but I don't think it's how you start. It's how you finish."